We're about to have another conversation about your baffling decisions again--this time your decision to completely erase the Justice Society from the current Earth-2. This isn't even going into the fact that Earth-2 was the biggest wasted opportunity of the New 52--a discussion for another day. What's more baffling are the reasons for the erasure of the Justice Society, and dumber yet was the decision to destroy Earth-2 after only three years of existing. Even if the Justice Society does form on Earth-1 with the refugees from Earth-2, it'll be nothing short of another Justice League team on an Earth full of Justice League teams. What was it about the original Justice Society that made it stand out from the Justice League? Well, for starters, it was the first and oldest superhero team to ever come into existence. Originating in the World War II era, the Justice Society allowed for the various DC heroes appearing in comics such as the Flash, Green Lantern, Superman, Wonder Woman, Batman to come together for the first time in a time of war. In a time that saw Europe and Asia being invaded by extremists brutalising and committing mass genocide of various groups of people across the world, these heroes embodied hope. Icons like Superman and Wonder Woman in particular existed as power fantasies for the oppressed and embodied the best of humanity. 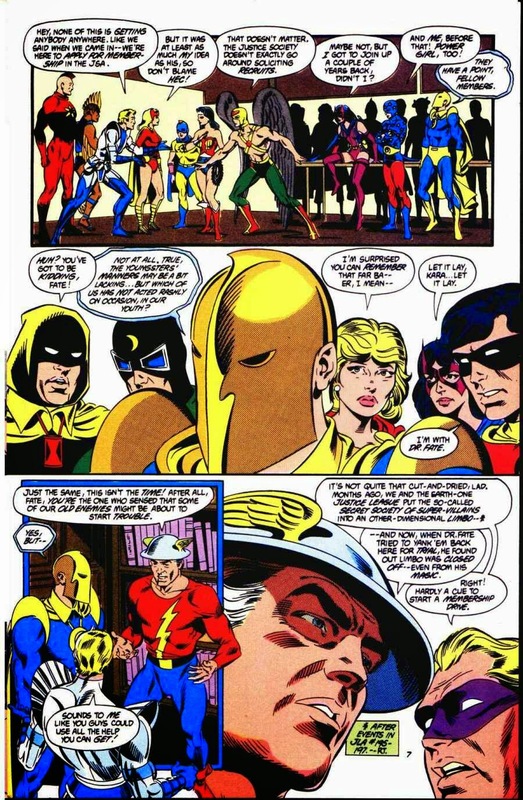 In addition to fighting against the Axis powers during World War II, the formation of the Justice Society allowed for superheroes to become friends with one another, and work together as a team to solve the world's problems or fight against various supervillains like Per Degaton, Brainwave, Solomon Grundy, Psycho Pirate, and other members of the Injustice Society. In many ways, the Justice Society was in itself a family of superheroes. Not only did these characters look out for one another, but as time progressed, so did the team. As mentioned in the Introduction post of these series of letters, the heroes aged, they married, they had children of their own, and--as in the cases of Huntress and Power Girl--the children even succeeded their parents as members of the Justice Society. Others like Hippolyta Trevor, Hector Hall, Jennifer-Lynn Hayden, and Todd Rice (the children of Wonder Woman, Hawkman and Hawkgirl, and Green Lantern respectively) formed a new team of their own called Infinity Inc.
Not only did the history of Earth-2 and the Justice Society pave the way for a new generation of superheroes (specifically legacy heroes), but it was also the beginning of the formation of a more diverse and modern Justice Society team. It allowed for older superheroes (including older female superheroes like Wonder Woman) to still function as world protectors, which combatted the very real prejudice of ageism. With the inclusion of Robin, Huntress, and Power Girl as members, the Justice Society started becoming more diverse in age. 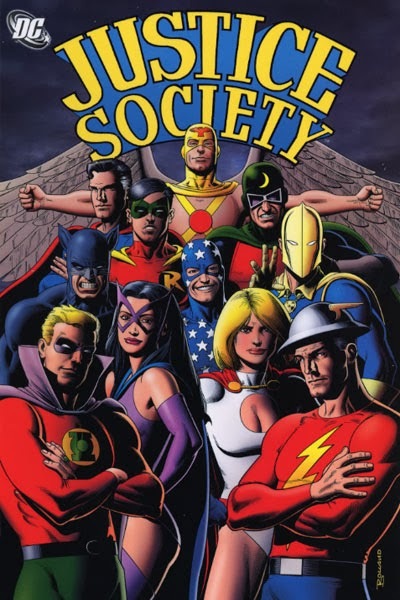 If the post-Crisis Earth-2 was still considered a part of DC canon prior to the New 52 reboot, eventually most of the older Justice Society members retired and their children (the Infiniters) took their place, which was the beginning of making the Justice Society more racially diverse, even inclusive LGBTQ characters like Obsidian who was eventually established as gay. With the New 52, there could've still been an older Justice Society team dating back to the World War II era with newer generations becoming members of the team over a period of time. The founding members of the original team could've still been Wonder Woman, Flash, and Green Lantern. They could've even still been active in the current incarnation of the team, given that they are all connected to the power of their world. Wonder Woman is an immortal Amazonian princess who's longevity is connected to the Greek (now Roman) gods, and the existence of the Fountain of Youth. In the New 52, Alan Scott is now connected to the green avatar, which could easily preserve his longevity. Even Jay Garrick now got his powers from the god Mercury (the Roman equivalent of the Greek Hermes) instead of inhaling water vapours, which again could've preserved his longevity. The original Justice Society team could've still comprised of Al Pratt as the Atom, Kent Nelson as Doctor Fate, Charles McNider as Dr. Mid-nite, Ted Knight as Starman, Terry Sloane as Mister Terrific, Wesley Dodds as Sandman, Rex Tyler as Hourman, Ted Grant as Wildcat, Ma Hunkel as Red Tornado, Carter and Shiera Hall as Hawkman and Hawkwoman, etc. Clark Kent, Bruce Wayne, Dinah Drake, and Michael Holt could've easily been inspired by the older first generation Justice Society to become the superheroes Superman, Batman, and Black Canary respectively, and could've easily been the team's second generation members, thus preserving the team's age diversity. Michael Holt could've even become the second generation Mister Terrific upon the retiring of Terry Sloane. Jack Knight could've easily taken over his father's identity of Starman, Rick Tyler as Hourman, and Maxine Hunkel as Cyclone. Even Wonder Woman's own daughter, Hippolyta Trevor, could've still been the daughter of Steve Trevor and been a second generation member as Fury. Helena Wayne, Kara Zor-L, and Dinah Laurel Lance could've easily been the third generation members as Huntress, Power Girl, and the second Black Canary. Yolanda Montez could've easily been the second Wildcat within this generation. Beth Chapel could've easily been the second Dr. Mid-Nite, and even Jennie-Lynn Hayden and Todd Rice could've joined as Jade and Obsidian. Even the newer characters that debuted with the New 52 like Khalid Ben-Hassin could've easily taken over as Doctor Fate, and Kendra Munoz-Saunders could've easily been Hawkgirl. The third generation Justice Society could've been a more diverse team yet with the addition of more women, more people of colour, and even LGBTQ. Some of these same members like Fury, Huntress, Power Girl, Jade, Obsidian, and so forth could've still founded a new team in the form of Infinity Inc.
Having examined where the New 52 Earth-2 could've gone, DC Comics, I came to the conclusion that it very much IS possible to update the concept of Earth-2 AND still preserve the original history of this world. A lot of what made the original Earth-2 special and genuinely different from Earth-1 was the established history and the fact that it was built on generations of heroes. Heroes have been around for decades. Heroes aged, married, and had children of their own. Heroes retired and even their own children became superheroes themselves. Some became members of the Justice Society and others formed their own team like Infinity Inc. Even newer heroes unrelated to the original Justice Society members emerged and joined both of these teams. There was absolutely no reason to go the route you did with the current continuity, and now, there is absolutely NOTHING genuinely different about the New 52 Earth-2. Much of the original concept of this world was thrown out like yesterday's trash, and many of the newer concepts that replaced it were more regressive than progressive. With the decision to kill off all married superheroes, deage the more prominent Justice Society members into younger characters while retconning others out of existence, Earth-2 became nothing more than a poor man's alternate DC universe. This was especially true with the decision to replace Huntress and Power Girl as successors to Batman and Superman with two men, one of which was a more insulting decision than the other. Let's also not forget the fact that Earth-2 is now a genuinely darker Saw marathon than the primary Earth-1 universe. Honestly, DC. At this point I'm starting to think I should reboot Earth-2 for you because I think I can do a better job at it than the people who were put in charge of it. It was, as I said at the beginning of this post, a greatly wasted opportunity. And for what exactly?